Didi is a Nigerian/South African Journalism student, here in Bristol talking to people in the city as part of her research. She wanted to study Bristol because of its diverse cultures, and she wanted the experience of living outside of her comfort zone, it has been her dream to live in the UK since she was 3 years old, when her dad would speak about his university days in London, and all the friends he made in a city where people coexisted, no matter their culture or country of origin. 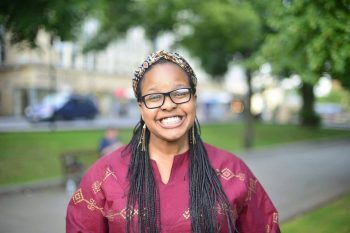 “Growing up with a Nigerian mother, food was always important, my mum would say ‘you should be able to cook, for yourself, your husband or your family’ – Even though, in other areas, she was most definitely a feminist. Cooking Nigerian food has allowed me to identify myself as Nigerian in a country where people were always asking me and my family where we were from. Food helps me connect with Nigeria because I don’t visit it very often, it provides a tie with my heritage. I never liked the process of cooking until the summer before I left to study Print Production at university in Cape Town. I still hadn’t learnt how to cook, so it was kind of a do or die situation. My mum would make me sit in the kitchen, so I could watch her cook and learn from her. She would make traditional soups like egusi, banga soup and cook efo riro. She would make me follow how she added the spices to her dishes and make me taste everything she made. It would make me upset because I always felt there were other, more important things to be doing – like reading, or hanging out with my brother. But in my first year at university, I got tired of eating western food. I needed my stews and jollof rice, plantain and the tastes of home. And I figured, if people were asking me where I was from and I was answering “Nigerian”, then I should know how to cook the food! Learning to cook like my mum did, made me feel a deep connection with Nigerian culture and allowed me to say “I am Nigerian” with pride. Though we have tried to write down a recipe for one of her dishes, my Mum never uses recipes, she cooks from the heart and by heart. You have to be with her to taste her amazing food and understand how it’s done.